This heart cushion is a perfect project to make on the week of valentines day. The basic project is quick and simple, but if you have more time then you can add embellishments or try some of the blanket stitching that I have attempted. Here is how I made it. I found nine different off cuts of materials in the same colour range, though you could do this with only one fabric design and use it nine times. Precision has never been my strong point and so I ironed all the squares of fabric onto some bondaweb. Bondaweb is a double sided adhesive that allows you to stick two sheets of fabric together. It can be bought at all sewing shops for a few pounds a meter and you iron the fabric you want onto the sheet which heats up and causes it to stick. Once the first layer of fabric is ironed onto the bondaweb you can draw onto the paper side of the bondaweb allowing you to mark and cut out a precise shape. I used a heart template that I drew around on the bondaweb with a pencil and cut out my nine fabric hearts. You could use any shapes including stars, letters, flowers etc. To adhere the hearts to the next piece of fabric you peel off the paper and iron the two together to bind them. 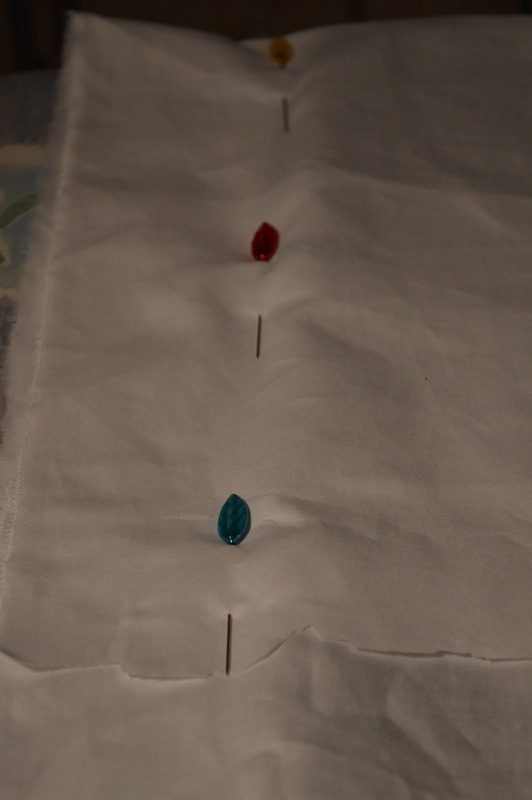 Here you can see the nine hearts being ironed onto a long strip of white cotton fabric. The size of the hearts and the length of the fabric depends entirely on how large your cushion is. I would advice using a length of fabric that is two and a half times the length of the cushion you are making and 1 and a half times the width. This will allow for hems. Bondaweb is designed to bond material together, though I have found that it is not 100% reliable and certainly over time the edges can fray. If you are a good machinist I would suggest you use an overlocking stitch to sew around the hem - this video demonstration will help. If you fancy something more challenging then use the blanket stitch that I have used on my hearts. I have never used this stitch and the first heart took me almost half an hour, but by the end I was finishing them in just under 10 minutes. It is time consuming but I think it makes the cushion look so much lovelier. For a blanket stitch tutorial watch this video demonstration. In order to get my cushion as precise as possible I used the old cushion cover as a pattern. I laid it over the design and folded the edge I wanted to be seen on the back (a hemmed edge) over the cushion cover (you can see it covers 80% of the cover). Then I folded the next side back over covering up the whole cover (again covering 80% of the cushion length). 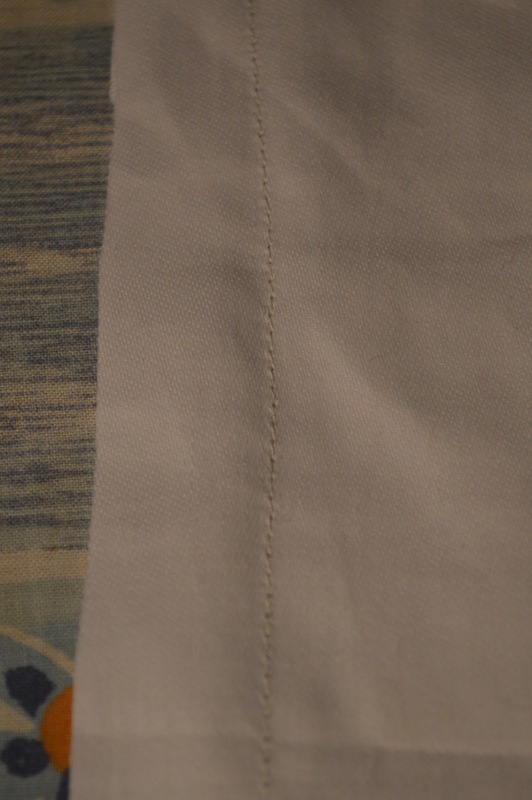 Then I pinned down the side of the fabric using the cushion underneath as a guide. Once I had finished pinning down both sides I removed the old cushion cover through the folded layers and sewed down the lines I had pinned out. Finally I trimmed the edges and turned the whole thing inside out to reveal the finished cushion. I apologise for my somewhat haphazard approach to sewing and hope it won't deter any of you from attempting such a project!